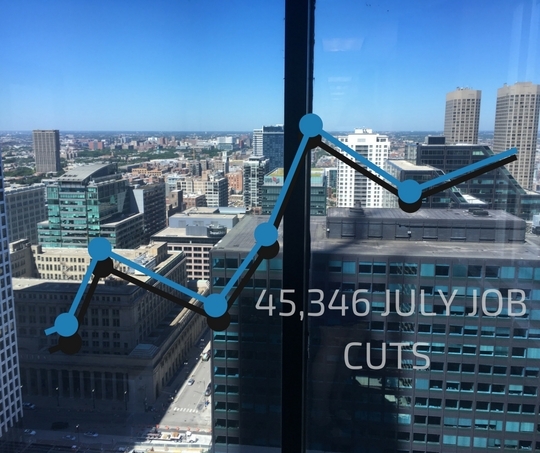 2016 July Job Cut Report: Cuts Jump 19 Percent to 45,346 | Challenger, Gray & Christmas, Inc. It was the second consecutive increase in monthly job cuts, as the June total was up 28 percent from May, when planned layoffs fell to a five-month low of 30,157. While the July total was up from the previous month, it was 57 percent lower than same period a year ago, when job cuts surged to a 4-year high of 105,696. The increase was due to heavy cuts in the military, where 57,000 troops and civilian personnel were discharged in budget-cutting initiatives. To date, employers have announced 359,100 job cuts in 2016. That is down 8.7 percent from the 393,368 job cuts announced from January through July 2015. “While job cuts were up last month, compared to June, the total was still lower the July average recorded since the end of the recession. We did see a resurgence in energy-sector job cuts. This was somewhat unexpected in light of recent projections of increased oil prices and possible labor shortages in the industry,” said John A. Challenger, chief executive officer of Challenger, Gray & Christmas. Job cuts in the energy sector totaled 17,725 in July, a 796 percent increase from the previous month (1,979) and the largest job-cut tally for the industry since April, when these firms announced 18,759 job cuts. So far in 2016, energy firms have announced 94,936 job cuts. That is 37 percent more than at this point a year ago, when energy cuts totaled 69,550. Of the 94,936 job cuts in the energy sector announced this year, 83,412 have been blamed on oil prices. In all, low oil prices have claimed 195,415 jobs since mid-2014, mostly in the energy and industrial goods sectors. “Even as some oil-industry firms continued to reduce their headcounts in July, a report appearing in industry publication OilPrice.com noted that the number of oil rigs rebounded in May and predicted that firms will have a difficult time ramping up operations if and when oil and gas prices go up,” said Challenger. Indeed, a report released earlier this year by the American Petroleum Institute indicated that petrochemical companies will need to hire about 30,000 new workers each year over the next two decades to replace retiring employees. After the energy sector, the computer industry has seen the next highest number of job cut announcements this year. To date, these firms have reported 49,464 job cuts, including 9,875 in July. The year-to-date total is 94 percent higher than the seven-month total from 2015 (25,542).